“I think these rims will break sir,” a 22-year-old Darryl Dawkins dubiously said to his coach in November 1979. “Don’t be silly,” came the reply, “even Wilt [Chamberlain] couldn’t do it.” Yet sure enough, the next game his Philadelphia 76ers played ended with a dramatic, backboard-shattering dunk, sending teammates and opposition running alike. Three weeks later he did it again. “I had to see if I could do it again,” he confessed with a grin during a recent interview with Astro, and as a result of his ferocity, the National Basketball Association ruled that breaking the rim/backboard was punishable by a fine and suspension. Yet the legend of Darryl Dawkins, Chocolate Thunder flourished. I had the privilege of writing an interview for, and meeting, this retired NBA legend in Malaysia this summer where he was working with the NBA’s global youth outreach programs. A towering and attention-grabbing physical presence, Dawkins had a handshake that enveloped my grip and an infectious laugh that boomed. He often found himself at the center of attention, not because of a desire to be there, but because of the natural charisma and presence he had. I say “had” because Darryl Dawkins died of a heart attack last week. It can be hard to appreciate some people’s effects on the world, but when it comes to Darryl, his life struggle and values speak for themselves. One would assume that his iconic nickname “Chocolate Thunder” was generated by this imagination or by one of his teammates. Interestingly, it originated elsewhere. 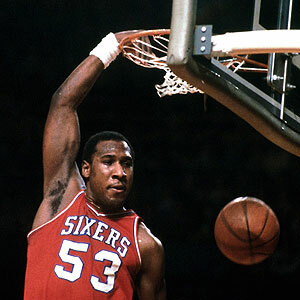 Musician Stevie Wonder, who is famously blind, used to attend 76ers games frequently in the 70s, would often refer to Dawkins as “big chocolate guy” who threw down “another thunder dunk.” Hence, when the two eventually met, Wonder gave him the nickname “Chocolate Thunder.” “If Stevie Wonder can call me that, I can be that,” proclaimed the legend. As for why he thought he had a chance to be in the NBA, Dawkins credits his family and his mother in particular. He comes from a family of 11 children, and she pushed him from a young age to be as good as he possibly could. He fondly recounted an anecdote from his childhood, when he strutted into his house and his older brother looked at him and asked, “What you all jacked up for?” Dawkins proudly declared that he had finally beaten his mom in 1-on-1 basketball outside on the driveway. Admittedly, his mother, Harriette, was 6-foot-1 and “would come out and beat you whenever you thought you was good,” even throughout his illustrious high school career in Florida. She taught him that if you believe it, whatever ‘it’ may be, you can live it. This philosophy carried him through his career the NBA. Along with his competitive drive and confidence in himself, Dawkins was at his core a true family man. When talking about the importance of being drafted and making it in the NBA, he glowed when talking about being able to send his brothers and sisters to college and buying his mother a new house. In fact, when he went pro he said that this was his main motivation for skipping college — he wanted to get his mother “out of the project” she was living in. He claimed that his bed was far bigger than a king-size, for whenever there was a thunderstorm his entire family piled in, including his 5-foot-11 11 year old daughter and 12 year old son, yet to hit his growth spurt, who already stands at 5-foot-10, as well as his wife and 19 year old son. And the cat. Dawkins had no issue with this though, and just good-naturedly appreciated that at least the dog stayed downstairs. Darryl Dawkins was not just a solid NBA player. He was a building block for the sport, a necessary stepping stone to the high-flying excitement of today’s NBA. He was himself on and off the court and never tried to hide his eccentricities or emotions, but instead, lived them. He was a global ambassador for basketball, traveling around to talk to, coach, inspire, and meet young talents across the world. He was also a self-declared “foodie.” But above all he truly was a family man to his core, in all respects of the word. It was a pleasure to meet him and witness the manner with which he brought everyone around him to ease, the way with which he made people laugh genuinely and how his eyes lit up when talking about his wife or kids. People will never forget Chocolate Thunder, who did the impossible. Twice. Baloney! Wilt Chamberlain could have shattered the backboard anytime he chose to. He just chose not to make a clown of himself, and delay the game. He was bigger and stronger than Dawkins. Just ask Bob Lanier just how strong he was. A lot of players could have done it. Just Dawkins and Shaq decided it would be fun thing to do. To be fair to Wilt, he dunked in a way that it was impossible for him to break backboards (which in fact he did do once or twice, i know he did it once in 1968 and can’t remember if he did it another time). If you watch the film his hands were already close to the rim, he only had to do a small hop and while it appeared he would dunk with two hands, it was always his right hand doing all the work. His hands were so big he had complete control of the ball and felt no need to even grab onto the rim since his feet touched the ground sooner than it did for others.